Been to Stars Hollow recently? Do you require coffee with your oxygen? Longing to spend a morning hanging out at Luke's? These cute pouches are an essential for all honorary Gilmore girls! What a cute present for a Gilmore loving friend! The outside of these pouches features a cute Gilmore inspired embroidery design embroidered on a mustard colored linen blend fabric. 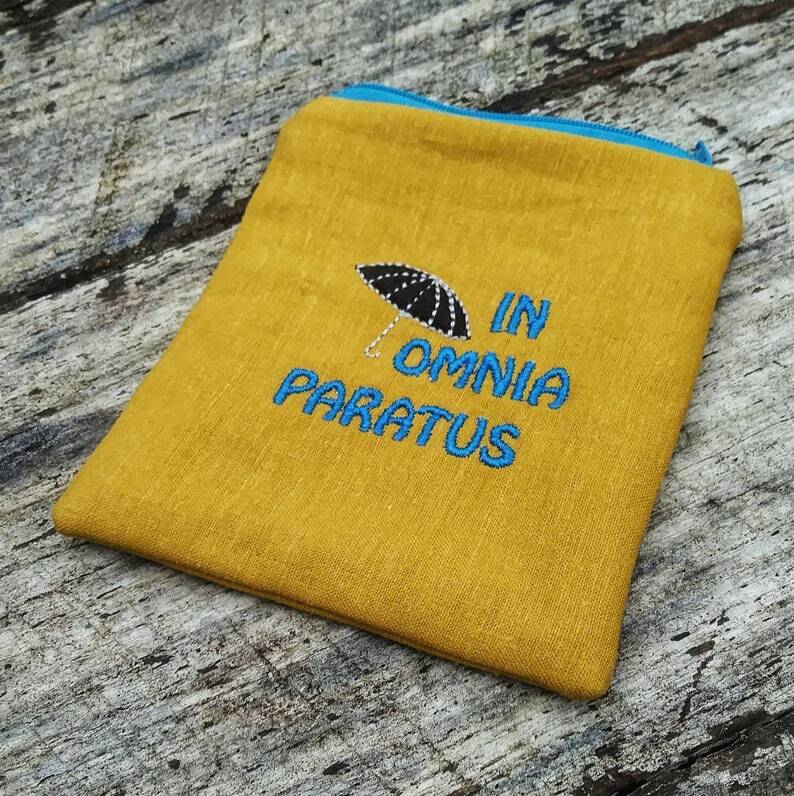 The "in omnia paratus" pouches are lined with black fabric accented with white and gold umbrellas. A hidden layer of flannel between the fabrics gives the pouch a little extra body and a nice squishiness. Each pouch measures approximately 5"x5" inches. Pouches can easily tuck into any other order and will ship within the U.S. for no additional cost if purchased with another item. All items ship from our smoke-free home. These pouches can also be made in other thread, fabric or zipper colors. Please send me a convo if you are interested in a custom order. If you have any questions, please feel free to ask. Butterflies or Moths Charcoal Gray Zipper Pouches Makeup Bag, Rectangle and Square. Jewel tones.